Now this was an interesting trip. Originally, we had thought about doing something in the Little Lakes Valley or maybe even Mount Tom, but the weather forecast was rather bad and we therefore decided to just drive up and down CA-395 and to look for some opening in the weather so we could do a quick hike. Rich, Tina and I left Rich's house at 4am and by the time we arrived in Bridgeport, everything was completely overcast. We continued down to Lee Vining but did not find any better conditions. Rather than wasting precious time on a continued drive down the highway, we turned around and drove up to the Virginia Lakes Trailhead. I had been here once before on a previous trip when I climbed Dunderberg. The road was plowed almost all the way to the lakes and we set out soon after arriving there. We hadn't brought a map nor would it have done us any good, because we could not see much anyway. What we saw however, was quite pretty, a nice wintery landscape in mid May. I know that Dunderberg was located on the right hand side and therefore aimed at the left, not knowing what would expect us there, but hoping for the best. After about an hour we arrived at an upward sloping part of a mountain. We decided to just go up it and see how far we would get. Any upward slope must top out somewhere and although we had now idea what mountain and elevation we would arrive at, we were adventurous enough to try it. Higher up on the mountain it started snowing pretty hard (so much that on our descent we could not find our tracks anymore), but openings in the clouds hinted at some ridge leading to a summit not too far away. Sure enough 20 minutes later (Tina had dropped their backpacks) we though that we arrived on that very summit only to realize that in the distance there was another one. The next higher point had what looked like a flagpole sticking out. This must surely be the summit we thought, but once again arrived at that point and seeing another higher point up on the mountain through a break in the clouds. Frustrating. Tina and Rich were getting rebellious, but I suggested to go one more time and if the next one would not be the summit, I promised that we would turn around. Did I mention that it was snowing hard? We spent the next ten minutes navigating over to the next highest point. We had to hike around a couple of outcroppings of rock and although nothing was more difficult than class2+, the slippery conditions and poor visibility made the whole undertaken very interesting. Finally, we arrived at the summit and because we could not find a register or anything but white in the surrounding landscapes, we did not spend a long time there before heading down again. 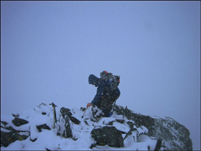 It was snowing even harder by now, which complicated the matter of finding Tina's backpack. However, we did find it and after some glissading and generally quick descending, we arrived at a lower elevation, where we somehow had gotten out of the wind. Suddenly, the whole affair turned into a leisurely stroll through a beautiful snowy landscape. We arrived at the trailhead soon thereafter and found the car completely covered with snow. Interesting conditions on this trip. We did bring the GPS and never ventured to far away from the trail, but still it would have been too easy to get lost.